The RoomPlace today announced the expansion of its footprint in Indianapolis with a new 160,000 sq. ft. warehouse and showroom facility located at 8301 E. Washington St. 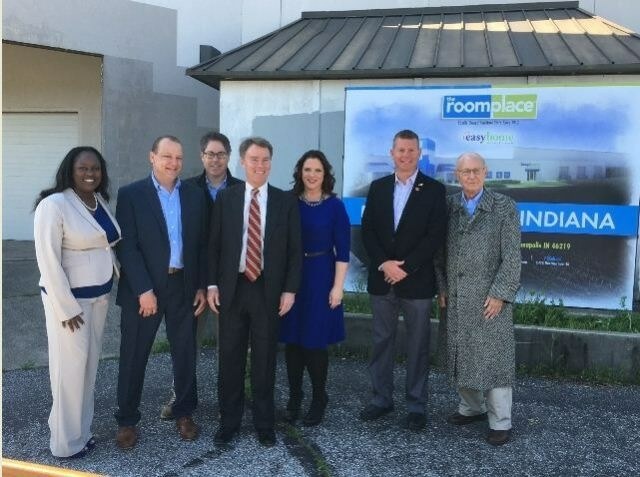 The facility will serve as the primary distribution center for the Indianapolis market and will house the sixth RoomPlace showroom in the area. This new location will also house the corporate headquarters of The RoomPlace's rent-to-own retail division, EasyHome. Opening in late fall 2016, these new developments will provide over 100 new local job opportunities. "Our decision to expand our regional sales and distribution centers, as well as introduce this as the location for the new corporate headquarters of EasyHome is a demonstration of our commitment to the city of Indianapolis," said Paul Adams, Chief Executive Officer of The RoomPlace. "Through our rapid, continual growth, we are excited to not only bring new employment opportunities, but also to be a part of the revitalization of the Indy East Side." The building, which has been vacant for 20 years, is owned by Sandor, one of the largest privately held shopping center developers in the nation, owning and operating over 8 million square feet of retail across 25 states. Founder and Chief Executive Officer Sidney Eskenazi brokered the deal with The RoomPlace as part of a larger partnership between the two companies. This economic development opportunity serves as a catalyst for the renewal of an Indy East Side corridor that has been waiting to welcome a company of this magnitude. "I am pleased that The RoomPlace recognizes the opportunity for growth in Indianapolis and has renewed their commitment to this community. For years, the east side of Indianapolis has suffered from stagnation and a lack of well-paying job opportunities," said Mayor Joe Hogsett. "Today's announcement represents a turning point in the redevelopment of the National Road corridor and I look forward to continued investment and growth by businesses like The RoomPlace in the coming years." The RoomPlace has been proudly serving the Chicagoland and greater Indianapolis area since 1912 with stores that are committed to creating a shopping experience unlike any other, all while offering excellent service, a great selection of quality furniture, name brand mattresses and financing offers that really allows customers to "Get It All." The RoomPlace remains committed to additional growth as well as its commitment to providing employment opportunities throughout Illinois and Indiana. For more information about The RoomPlace, visit TheRoomPlace.com. Join other RoomPlace fans on Twitter @TheRoomPlace, Instagram and Facebook.